If the EU referendum had been run with the same rules as Scotland’s first referendum on devolution, the Leave vote would still have won – but Brexit would not now be happening. That’s because in Scotland’s first referendum on devolution in 1979, our Parliament passed an amendment to the Scotland Act 1978, which set a minimum threshold before such a significant change could take place. The amendment stipulated that a minimum of 40% of the total electorate in Scotland would need to vote for the country to have its own assembly before it could happen. As it turned out, 52% of those who voted ticked ‘Yes’ for power to be devolved to Scotland, with 48% ticking ‘No’ – ironically, exactly the same percentages as our UK-wide EU referendum of 2016, which was 52%-48% in favour of Britain leaving the EU. Since the percentage of those voting ‘Yes’ for devolution was only 33% of registered voters, Scotland on that occasion didn’t get its own assembly, because Parliament had set a threshold of at least 40% of the electorate voting ‘Yes’ before it could happen. The then Labour government accepted that the Act’s requirements had not been met in the referendum, and that devolution would therefore not be introduced for Scotland. Setting a minimum threshold for constitutional change is normal practice among democracies across the world that use referendums. For example, a threshold of higher than 50% of the total electorate, or a two-thirds majority of those voting, before a country’s constitution can be changed. This makes sense, since if the majority of a country’s electorate doesn’t positively agree to change – whether they vote or not – it means that a minority is making the decision without the express wishes of the majority. Well, that’s precisely what happened in the EU referendum. Unfortunately, Parliament on that occasion didn’t set a threshold requiring 40% of the total electorate to vote for ‘Leave’ before it could happen. That’s no doubt because, unlike the Scottish referendum in 1979, the EU referendum of 2016 was advisory only. 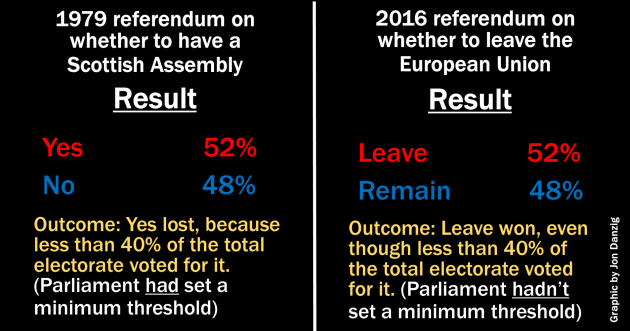 However, since only a minority of the electorate voted for Leave, it would have been plausible for Parliament to say that an insufficient percentage of voters had voted for Leave. In the EU referendum, only 37% of the total electorate voted for Leave. If Parliament had set a minimum threshold of at least 40%, as it did for Scotland’s first referendum on devolution, it would mean that Brexit wouldn’t now be going ahead. If such a threshold had been in place, it would have avoided the constitutional crisis that has now engulfed the United Kingdom, involving a minority of the electorate permanently changing the country, without the express consent of the majority. 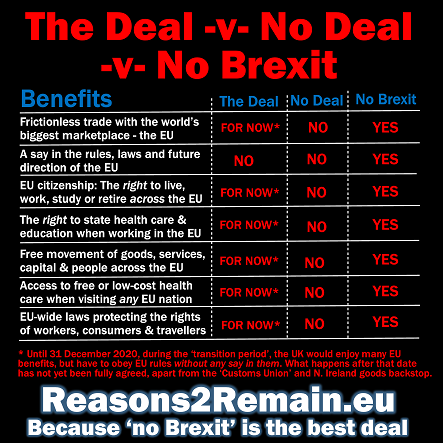 Some readers (Brexiters) may ask what does it matter? The referendum has happened, according to the rules agreed by Parliament, and we can’t turn back the clock. 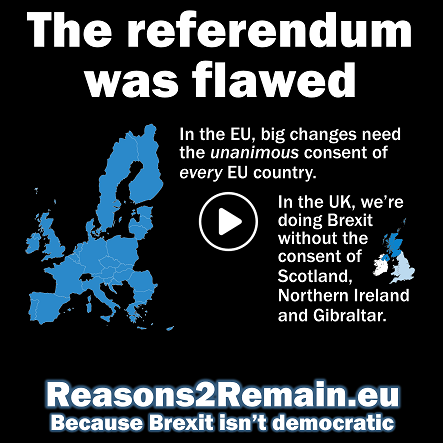 However, there were so many flaws in the EU referendum that I believe it’s necessary to expose the plebiscite for what it was: a sham involving a democratic deficit on a grand and shocking scale. If we dismantle the referendum, brick by brick, we can see that the country is being changed without a bona fide mandate to do so. • It’s just been announced that Cambridge Analytica, the company at the heart of the Facebook scandal, boasted of having “vast amounts of data” that could sway the 2016 referendum on membership of the European Union. A 10-page document written by Cambridge Analytica, headed “Big Data Solutions for the EU Referendum”, claimed it could single out Brexiters among voters, donors, politicians and even journalists. MPs have called for a wider investigation into the firm, which has been accused of obtaining 50 million people’s private details harvested from Facebook, amid questions over the role it may have played in the referendum. 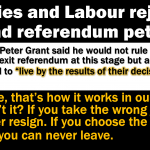 • During the referendum campaign, the country was lied to by the Leave campaign on a scale never seen before in a modern UK poll. Millions of voters opted for Leave on the basis of promises about Brexit that can never be fulfilled, and misleading information about the EU that was demonstrably wrong. Without such dishonesty, it’s almost certain that Leave could not have won. • Nobody during the referendum campaign knew what the Leave vote meant. We knew what Remain meant, as we’d had it for over 40 years. But there was no clear vision or manifesto or plan for leaving the EU that the voters could consider, let alone understand. We still don’t know what Leave means. • In 2015 the Conservatives made a manifesto pledge to scrap the rule preventing Britons from voting who had lived abroad for more than 15 years. However, the Conservative government stated that it could not implement this promise in time for the referendum. In addition, many British voters abroad who were eligible to vote, complained that they had not received their postal ballots in time to cast their votes. Without this debacle, it’s quite likely that Leave would not have won the referendum. • Citizens from over 70 countries (mostly Britain’s former colonies) with ‘leave to remain’ in the UK were allowed to vote in the EU referendum, but most citizens from the rest of the EU living and working in the UK were denied a vote, even though the referendum result directly affected them. This represented a serious democratic deficit. (After all, citizens from the EU living in Scotland were allowed to vote in Scotland’s referendum on independence). 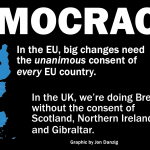 • The House of Lords put forward an amendment that 16 and 17 year olds should be allowed to vote in the EU referendum, in the same way that they were allowed to vote in Scotland’s referendum on independence. But the Commons rejected this amendment, “Because it would involve a charge on public funds”. So younger people, who will have to live with the referendum decision for the longest, were denied a vote simply on the grounds of cost. (The cost of Brexit will be much higher). 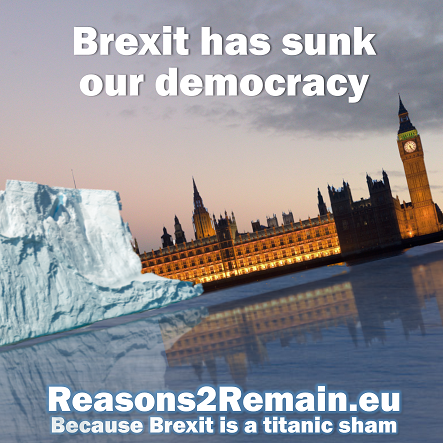 • As previously discussed, only 37% of the total electorate voted for Leave, meaning that a minority of registered voters are to permanently change the country’s direction, without the express consent of the majority. • Older voters are responsible for Leave winning, in particular the over 70s, who swung the vote for Brexit with their 1.28 million Leave votes. In contrast, younger people voted predominantly for Remain, by 75% to 25%. As older Leave voters die, and younger Remain supporting youngsters come of age, it means that if the Referendum had been held just a bit later, Remain would have won. • The referendum, by act of Parliament, was not legally binding, but simply an advisory exercise. The Supreme Court ruled that only an act of Parliament could result in Britain leaving the EU. But no such act has been passed by Parliament. The government wrongly advised Parliament that the decision to leave the EU had been made in the referendum, and that Parliament only needed to vote to give the Prime Minister permission to give notice to the EU that the UK was leaving. However, many leading lawyers are now saying this was incorrect. The referendum, being advisory, could not give an instruction on leaving the EU. Consequently, it’s claimed that Theresa May’s letter to the EU under Article 50 of the Lisbon Treaty was invalid. This is currently the subject of a legal challenge. These are just some of the key reasons why the EU referendum was flawed, leading to the biggest constitutional crisis for Britain in modern times. The EU referendum, like all referendums, was nothing more than a lottery. And unfortunately, this time, we are all the losers. This entry was posted in Current Affairs, Democracy & Citizenship, Law & Justice, Media & Communications, Politics & Public Policy, The EU and tagged brexit, democratic deficit, EU referendum, referendums, Scottish assembly. Bookmark the permalink.